Sunny Saw Up, photo by Harold Davis. View this image larger. I photographed this saw blade last year at Joseph Siroker’s Palo Alto studio. Our idea was to create shadows of everyday objects that seemed to be a little more alive than the objects themselves. 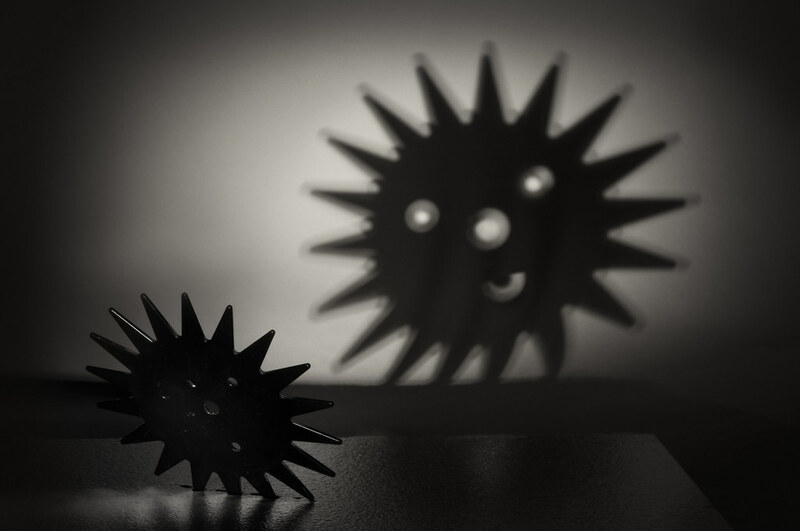 This saw blade shadow qualifies, with a little help smiling in the Photoshop Darkroom. Related image from the same shoot: Alter Ego. 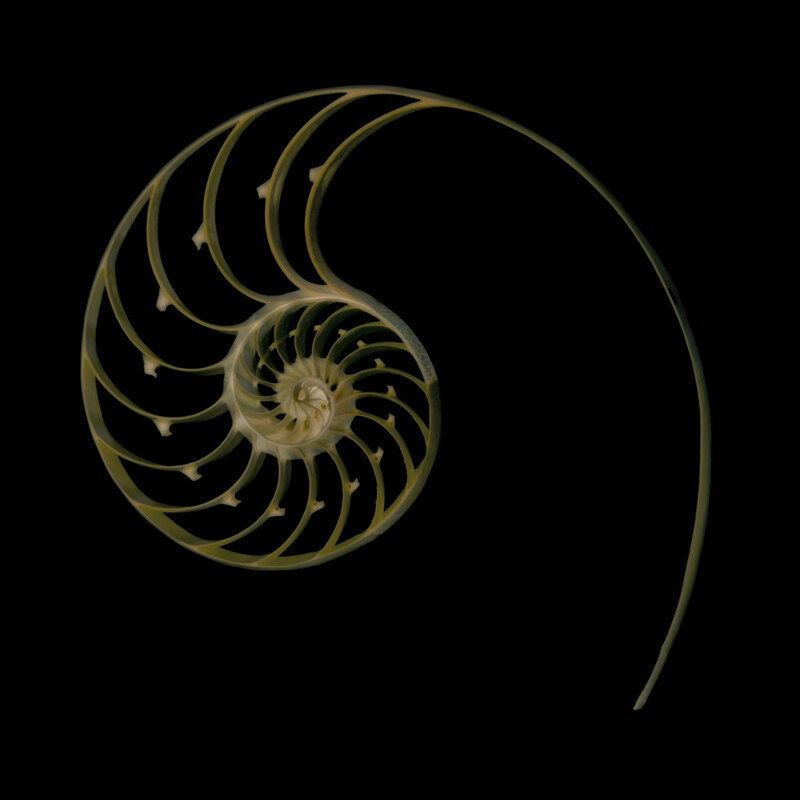 Nautilus Cross Section, photo by Harold Davis. View this image larger. First, I converted the image to LAB color, and inverted the Lightness channel to place the image on a black background. The shell was too dark on the background once it had been inverted, so I layered the original version back on top. 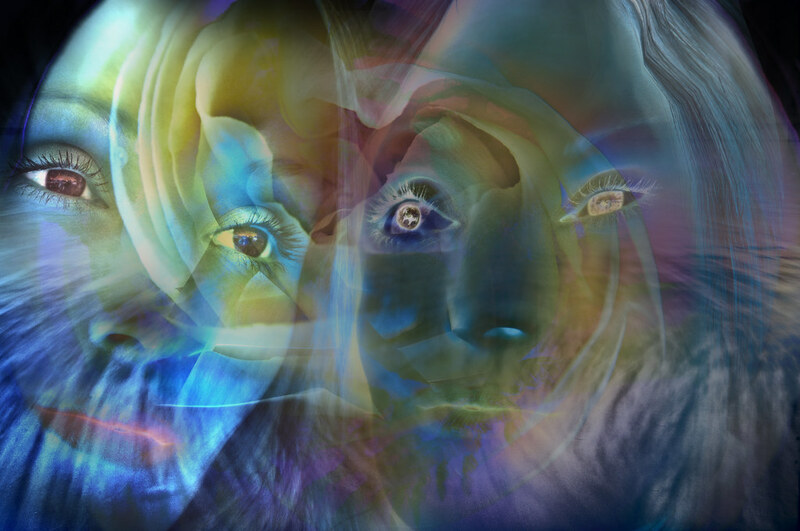 I used Blend If in the Layer Style Blending Options dialog to get only the shell portions of the image modified, and used a layer mask to further refined the changes I needed. I converted the image back to RGB, and layered a version that I had equalized in LAB back over it. 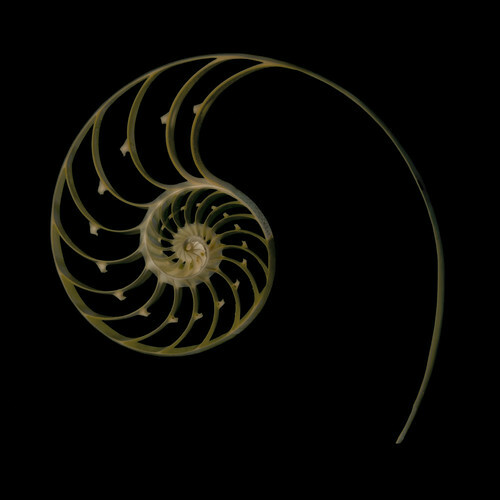 In this version, the shell was very dark. The Divide blending mode (new in Photoshop CS5) applied at low opacity (7%) allowed me to feather in a touch of additional special lighting effects because essentially it blended the dark layer as its opposite—attractively bright. If all this sounds complex, it is easier to do in practice than to read abstractly. Work on an actual example of your own and you’ll get the hang of it quickly! For more about post-processing, check out The Photoshop Darkoom: Creative Digital Post-Processing and our upcoming now-in-progress sequel filled with many new techniques, The Photoshop Darkroom 2: Creative Digital Transformations. 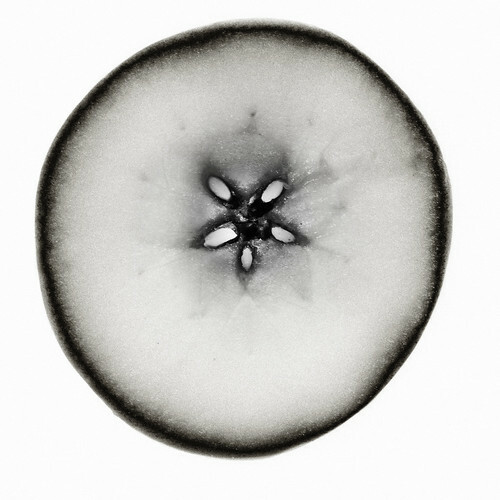 Apple, photo by Harold Davis. View this image larger. Half of an apple. Simple, basic—to the core! However, an image of this apparent simplicity is often not as easy to make as one might think. It usually takes a fair amount of artifice to create an image that seems very simple. Lost Mesa, photo by Harold Davis. View this image larger. 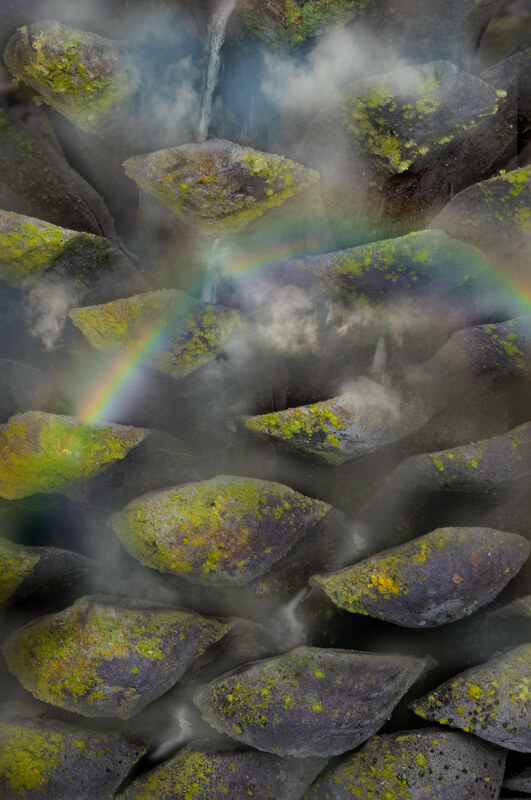 Following up on my threat (or was it a promise) to add waterfalls to a pine cone, I’ve created an impossible world. When I’m not taking kids to the Adventure Playground, this is how I spend my weekends! Besides the pine cone, this Photoshop composite includes photos from the Grand Canyon, waterfalls from Yosemite, and clouds from many places. Related stories: Impossible Images; Harold Davis: The Impossible and Improbable (PDF); Winter’s Bride; The Dictator’s Architect’s Dream; Hidden Worlds. 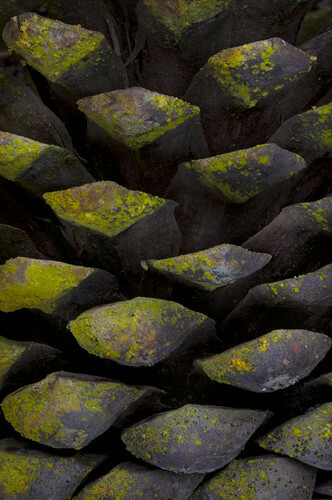 Pine Cone, photo by Harold Davis. View this image larger. On our way down to Kirby Cove, Mark and I passed this Pine Cone on the trail covered with green lichen. The close-up image reminds me of a geological formation—or an aerial view of a broken landscape studded with mesas. My next step once I figure out how: adding some waterfalls to this fantasy landscape-from-above. Back, photo by Harold Davis. View this image larger. Looking at this photo in Adobe Bridge, it was the most underexposed of the set—and very, very dark. The histogram was bunched tightly to the left. You’d expect some of the histogram to be left-biased. After all, the background is black—and an exposure histogram is a graphical representation of the distribution of values from dark to white. But most photographers don’t normally select captures where the entire histogram is essentially pinned to the left wall, which represents darkness. Of all the exposures with comparable composition, I chose this dark one. I take this as am important reminder: that “properly” exposed photos are rarely very interesting. It took me most of the day to “tease” the painterly elements of the rear view of this model out of this dark composition, and I intentionally left a great deal of the image in the dark. So this photo reminds me of another significant point. In life, a little mystery is more intriguing than complete revelation. So, too, in art and photography: You often get more mileage by not showing everything. Athena, photo by Harold Davis. 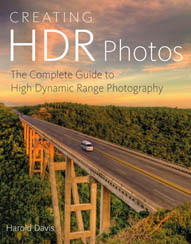 “HDR—High Dynamic Range—imaging is a technology, concept and aesthetic that has developed in the digital era in answer to the problem of the limited range from light to dark that can be captured using a single exposure.” (Harold Davis) There are a number of different software options out there for applying HDR during post-processing. The latest and newest is actually a feature included in Adobe’s latest version of Photoshop: CS5. In this tutorial, Harold explains how to use Photoshop CS5’s new feature Merge to HDR Pro, and walks us through the steps in an easy-to-follow tutorial. Read (and enjoy!) HDR in Photoshop CS5. 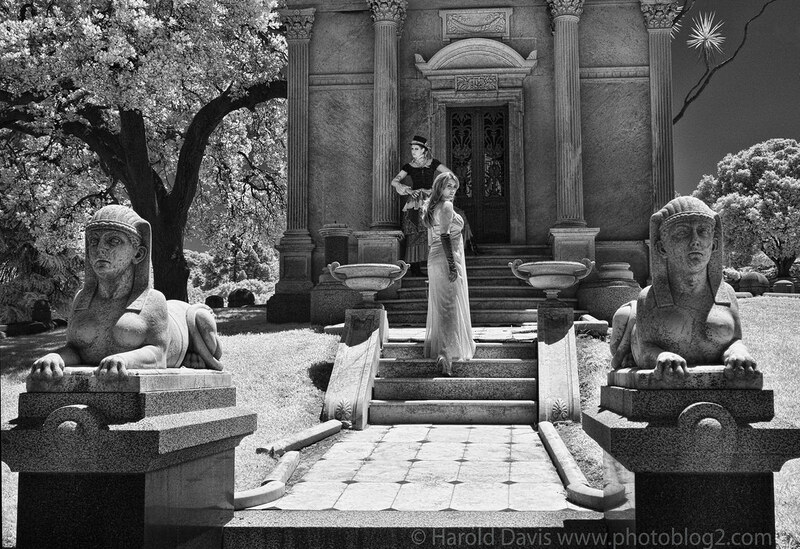 The Riddle, photo by Harold Davis. View this image larger. Briefly noted: What is the question? What is the answer? There’s a story here. But it’s carefully guarded by this pair of sphinxes who take their modeling seriously. IR capture with human (and stone) models at the Mountain View Cemetary in Oakland, California. 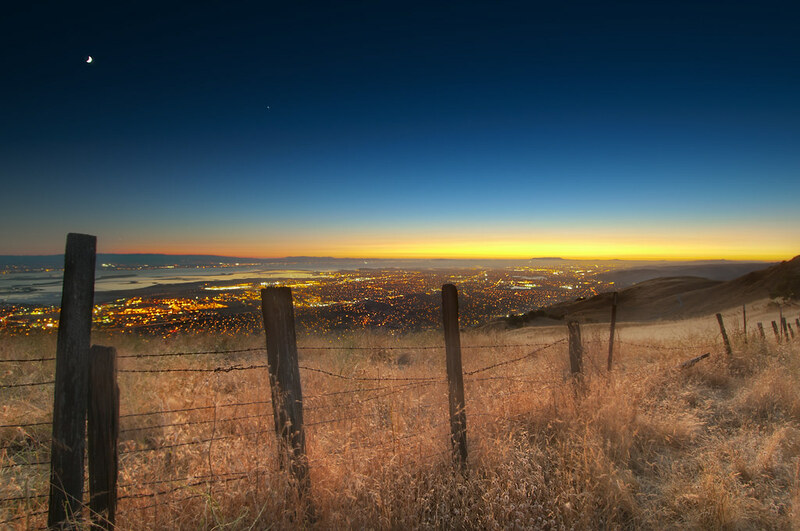 Mission Peak Sunset, photo by Harold Davis. View this image larger. On Thursday evening Steven, Eric, and I took the “steep trail” up the flanks of Mission Peak (above Fremont, California). 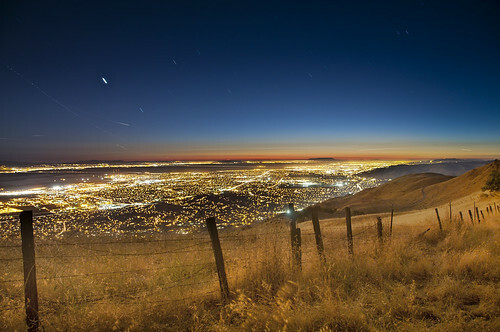 Steven’s goal was to set his camera up to take continuous 30 second star exposures over night. He planned to retrieve his gear the next day. The concept worked, the camera was still there, and the time lapse imagery, particularly the “Dazzler” section, makes for fascinating viewing. Check out the airplane trails in this star stack of Steven’s. On the hike we came across some toads, a snake skin, and some mortar holes to pound grain used before there was a Silicon Valley. Mosquitos bit, I got a few touches of poison oak, and the steep trail lived up to its name. All in all, par for the course for a dramatic night hike in California in the summertime. What I enjoy most about Mission Peak is the paradoxical sense of being both present and remote. The city is spread about below like a glittering river of lights, but the slopes of the mountain are serene and for the most part empty. 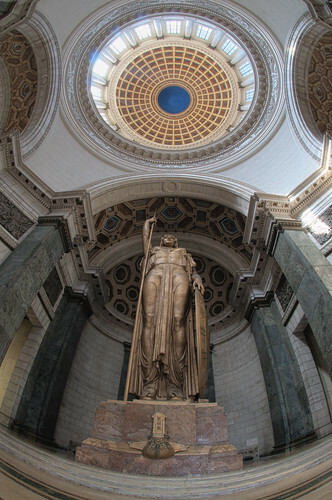 These two shots are HDR—High Dynamic Range—composites, each from five bracketed exposures. I put the bottom layers together using Adobe Photoshop’s Merge to HDR Pro. Mostly, this didn’t give me the tonal values I was looking for—so I manually layered in the earth and sky over the autoblend HDR backgrounds. My idea was to present the contrast I’ve mentioned between the remote and serene slopes of the mountain and Bay area civilization, apparently remote below—but actually only a few miles away. The Dictator’s Architect, photo by Harold Davis. View this image larger. 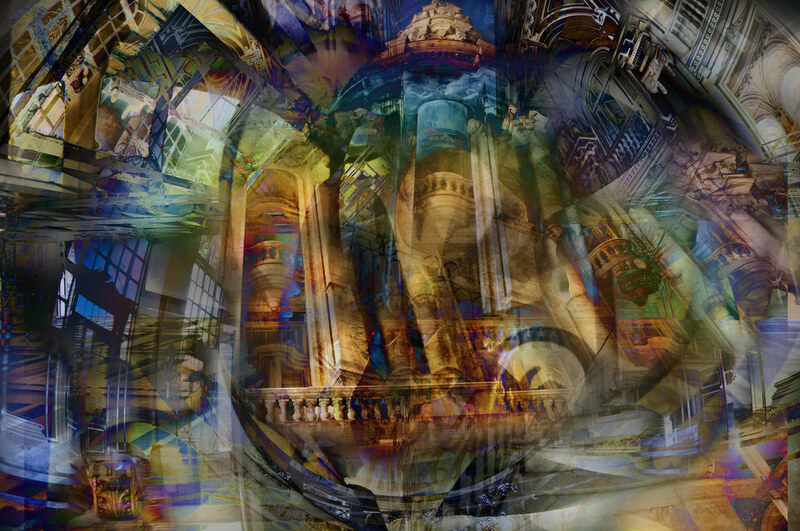 Briefly noted: This Photoshop composite includes pieces of governmental architecture from a number of places, including San Francisco’s City Hall and Fulgenica Batista’s Presidential Palace in Havana, Cuba. My idea was to create an architectural fantasy reminscent of a Piranesi etching. I wanted the colors to look like those you might find in a classical painting. I created this collage for use as section opener in a book. To get the overall sense of this one, you really need to view this image larger. Forest Light, photo by Harold Davis. View this image larger. Driving back from giving a weekend night photography workshop last year I took the back roads on the Big Sur peninsula. I stopped at this forest view and shot five exposures at roughly 2 f-stop intervals on tripod down in the dark forest with light streaming above. Getting home, I filed the captures and forgot about them. There are many fish to fry in my life. Yesterday, I came upon this sequence and decided to process the photos as an HDR image. Ultimately, this involved four trips through Photomatix, several monochromatic conversions, some layers in Photoshop, two Nik Color Efex Pro filters, two effects from Mystical Lighting, as well as some LAB channel adjustments. The image as presented is, of course, a physical—or at least visual—impossibility. You would never see the level of detail shown in the image in the real world in the dark, lower part of a forest when the bright light source was streaming down from high above. But the impossibility is plausible, which is part of what I seek in my compositions. 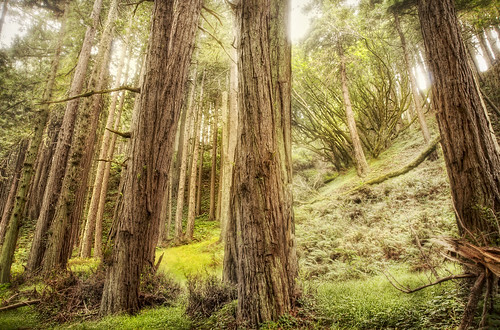 The only thing this forest lacks is a nice woodland fairy dancing along the forest paths among the shafts of light! Faking Star Trails, photo by Harold Davis. View this image larger. I faked these star trails. Meaning that this image is not based on an exposure, or combined composites of exposures, long enough to produce the star trails shown. The simulated star trails are an effect created in Photoshop from a single, relatively short exposure. 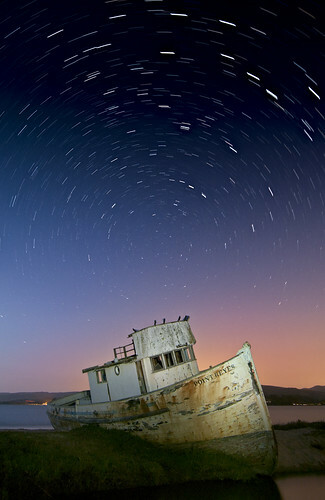 Ron Larsen, who attended one of my night photography workshops, pointed me to the Star Trails action in Photoshop CS5 Standard Edition. This action takes a single, static shot that includes stars at night and adds apparent motion to the stars in the form of trails. The best demonstration is given by Russell Brown in a video part way down this page of his Photoshop CS5 tips. The action works by successively copying and rotating the base layer of the photo, then compositing the stack of rotated layers together. There are some gotchas to using this action. First, it just ain’t natural—meaning this is merely a mechanical rotation rather than the real astronomical movement of the stars. More on this point later, but the simulation works pretty well if your camera is pointed due north, where the movement of the stars is pretty much curved around Polaris (the North Star). In other words, pointing due north the simple curvature model is pretty close to reality; however, in other directions this simple model fails fairly drastically. Another issue is that the stars in the photo need to be rendered as points. If the stars show motion by being elongated as trails before applying the action, then the action will create trapezoidal shapes in the sky, because the entire length of the original star trail is being reproduced in two-dimensions. This probably implies an exposure time of three minutes or less, possible at dusk before deep night comes on, or when the night is dark by substantially boostin the ISO. Both approaches have issues—a higher ISO implies more noise, and a star shot at twilight means that the easy layer blending the Mr. Russell Brown shows in his video is not really possible (the Screen blending mode only works in his cute example because of the near-Black background color of the sky). But qvetching aside, it is possible to get some attractive images using the Star Trail action. For example, I’m pretty pleased with the image shown at the top of this story. If you are interested, it was created from this three minute exposure I made a couple of years back. Blending of the foreground and the “faked” star trails layer was done using a layer mask and a gradient, along with some hand painting on the layer mask. I’m pretty pleased with the way the fake star trails came out, but it does lead to a moral question, or, dare I say it, a question of moral hazard. To get “actual” trails as long as the ones shown here would have taken somewhere between 20 and 40 minutes of exposure time and a great deal of patience. It doesn’t seem fair to be able to get attractive results without the same amount of effort. Here I am somewhat hoisted on my own petard. I’ve declared a number of times that images should be judged on how they come out, not the technique used to create them. It’s my considered opinion that work done in Photoshop is just as valid as work created solely in-camera. Following this logic, though purists may not agree, I have to conclude there is a place for faking star trails—although the technique has to be done with care so that it isn’t obvious. And nothing will replace the feeling of shooting through the night and coming home with a perfect composite for stacking of the stars wheeling through the heavens on their journey through the night! Steven Christenson points out that what the Photoshop action doe is to circle around the center of the image. Only if one exactly centered the exposure on the north celestial pole and then used the action would you get something that would be correct for a perfectly rectilinear lens. You can easily see if you compare my fake star trail image with the original on which it is based on that the stars are circling around the image center rather than north. A close-up examination of the fake star trails at high resolution shows they are formed differently from actual stacked composite star exposures. The fake trails are not curvilinear: there is a chunky looking step-out at the pixel level representing the duplication and changed position of successive layers created by the action. For more on stacking—the real thing—check out my blog stories Star Trails over Drakes Bay and Stacking Star Trails. You’ll find complete instructions for making photos of star trails, and how to use an interval timer, in my book Creative Night: Digital Photography Tips & Techniques. Becoming a Dream, photo by Harold Davis. View this image larger. Creativity is very important to me, in photography and in life. I do not think that being creative is a “tame lion”: there are no rules about how to be creative. Creativity is fluid and wave-like; it is not rigid, mechanical, or about repetitive rules. The thing I think I do best in my workshops is help people become more creative photographers and artists, and in how they approach their work. Embrace serendipity by being prepared for the unexpected. Focus on the essential elements of your chosen subjects. 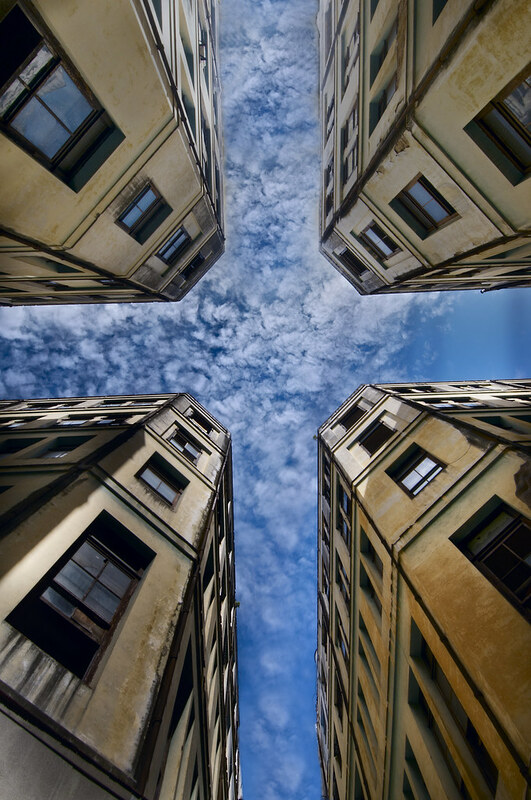 Consider form and composition when you create photos. Seek to reveal the previously unseen. Use your time wisely when on a creative journey. If you are creatively stuck, limit yourself; but be conscious of the ways in which you may be self-limiting without realizing it. 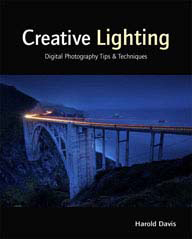 I wrote Creative Composition: Digital Photography Tips & Techniques from the perspective of using photographic composition as a stepping stone to visual creativity. This is not a book about the same, old rules of formal composition. It is an idea book intended to help you unleash your inner creative photographer, partly an idea book, and partly a meditation on composition in photography and creativity. My hope in writing the book was that it would provoke you to be your most creative, too. Cycle of Life, photo by Harold Davis. View this image larger. Spring turns to summer, the precise demarcation of the season change lost for me in a haze of books to write, photography in the studio, new Photoshop features to play with, and family matters. Not to mention the oddities of the Pacific weather system in coastal California, where July can easily be chillier with more fog than March or October. In my garden, my beloved poppies are no longer the prime attraction, being swiftly surpassed in sheer gaudiness of coloration by the Dahlias and Echinaceas. The world moves to a rhythm of its own, and our society has us on a treadmill that only seems to increase in velocity. With four kids, there’s always something to take care of: a doctor to visit, playdate to arrange, or mandatory school affair to show the parental flag at. But it’s important for me to take the time to sample the tempo of the growing things in my garden. They have a cycle of life that is all their own, as seen in this Papaver Rhoeas photo from early June. 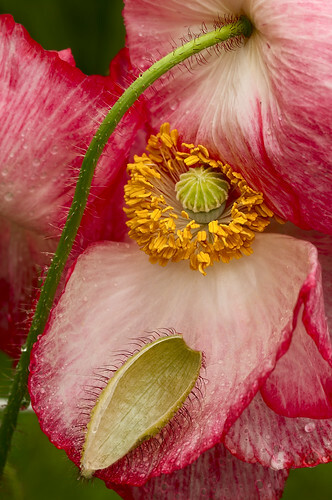 The Poppy in the center of the photo is mature, but the one to the upper right has just bloomed, shedding its delicate pod cover onto the petals of the more mature flower. The entire life cycle is compressed into a matter of hours, but seems somehow languid and dreamy if I take the time to observe it closely.